ਨਆਰਾ: "لا إله إلا الله، محمد رسول الله"
a. ^ Consultative Assembly of Saudi Arabia exists only with an advisory role to the king. ↑ "About Saudi Arabia: Facts and figures". The Royal Embassy of Saudi Arabia, Washington D.C. Retrieved 6 June 2011. ↑ "Saudi Arabia the country in Brief". Saudia-online.com. Retrieved 3 March 2012. 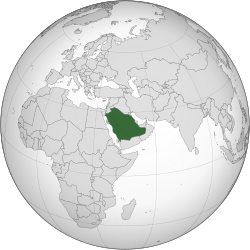 ↑ 5.0 5.1 5.2 5.3 "Saudi Arabia". International Monetary Fund. Retrieved 20 April 2012. ↑ "HDRO (Human Development Report Office United Nations Development Programme" (PDF). United Nations. 2011. Retrieved 2 November 2011. ↑ 8.0 8.1 "The impact of oil price volatility on welfare in the Kingdom of Saudi Arabia: implications for public investment decision-making". KAPSARC. Retrieved 30 July 2012. ↑ "Saudi Arabia: Administrative divisions". arab.net. Retrieved 21 September 2008.